The period between 1919 and 1923 represents Roland Wakelin's moment of genius. During the space of five years he embarked, through a series of tiny paintings, on his now-famous colour-music or synaesthesia experiments with Roy de Maistre, absorbed the sudden tonalist impact of Max Meldrum who visited Sydney in 1920, and in 1923 left for Europe to sort out these two diametrically opposed influences on the direction of his vision. 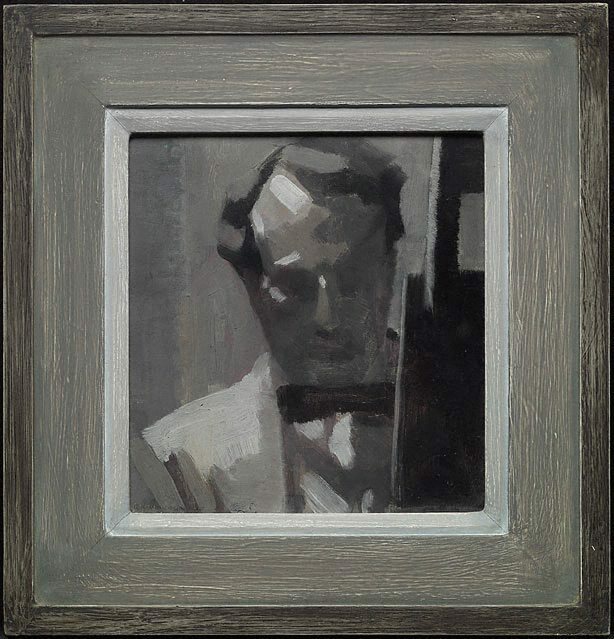 There are several self portraits by Wakelin of this period, including one of 1923 in the Art Gallery of New South Wales collection, but this work, painted in 1920, was of singular significance to the artist because it is the very first evidence of Meldrum's influence on him. Geometric disposition of shapes, cut-off relationship to the edges, and broad simplified brushwork contain all the sensibility of Wakelin's beautiful small landscape compositions of the previous year, but it is as if colour has been quite suddenly eliminated at the touch of a switch. This little self portrait remains compositionally the conception of a true modernist. Signed and dated l.l. corner, pen and black ink "R.S. WAKELIN 1920". Douglas Dundas, Art and Australia [series 5, vol. 4, no. 4] , 'Roland Wakelin the painter', pg. 278-282, Sydney, Mar 1967-May 1967, 282 (illus.). Misty moderns: Australian tonalists 1915-1950 , 'Max Meldrum and Australian modernism', pg. 89-110, Adelaide, 2008, 101 (colour illus. ), 140. NOTE: Refer to Meldrum in Sydney section. Tracey Lock-Weir, Artonview , 'Misty moderns: Australian Tonalists 1915-1950', pg. 18-19, Parkes, Summer 2008-2009, 19 (colour illus. ).